I ♥ E-Poetry is recruiting! We are seeking regular and guest contributors to continue with our mission of developing a current, scholarly, and approachable guide to electronic literature, one that can transcend beyond academic circles to more general audiences. I ♥ E-Poetry is seeks to explore the poetics of language wherever it is deployed in digital media, particularly when it engages its media in artistic and literary ways. We are open to any other areas you might be interested in exploring. See our current Call for Contributions for some areas that need some work in addition to the ones listed above. Guest contributors publish single entries, series, or sporadic submissions. Regular contributors publish on a schedule determined in conversation with the publisher and editor. This is a flexible commitment and can include daily (recommended for series), weekly, bi-weekly, and so on. 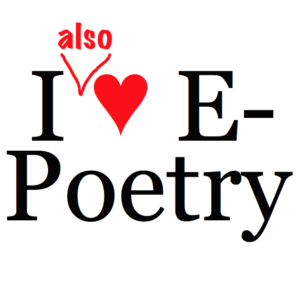 I ♥ E-Poetry is free, open access publication that operates on volunteer labor. That being said, we are seeking grant funding to scale-up our efforts. Active contributors will be given first priority to participate in our grant funding proposals. In the meantime, as suggested by the title, this is a labor of love, and its benefits to contributors come from cultural capital and exposure to a growing readership. Read my Year 3 Report for details. If you’re interested in becoming a contributor, please use the contact form below and tell us about your interest, qualifications, the areas you’d like to explore, and proposed frequency of contribution.